. . .I have not more than three days to live—"
"You take the thing too seriously," interposed his cousin. "Join me at Pit Place to-morrow," said Lyttelton. "Then you shall see if I take it too seriously." During the intervening two days he fluctuated between profound gloom and boisterous hilarity. One hour he was plunged into the depths of despair, the next he was the soul of gaiety, laughing hysterically at his fears, and exclaiming, "I shall cheat the lady yet!" During dinner on the third and fatal day he was the maddest and merriest at the table, convulsing all by his sallies of wit and his infectious high spirits; and, when the cloth was removed, he exclaimed jubilantly, "Ah, Richard is himself again!" But his gaiety was short-lived. As the hours wore on his spirits deserted him; he lapsed into gloom and silence, from which all the efforts of his friends could not rouse him. 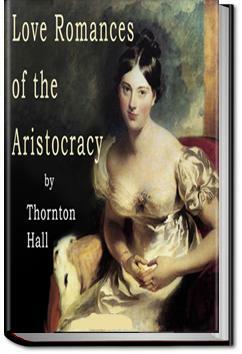 The title is somewhat deceiving because some of it doesn't deal with romance at all, but are just tales of notorious aristocrats. Yet it still managed to be solidly interesting. Very entertaining for those interested in the romantic lives of royalty. It reads like a tabloid or gossip column, only written in a cultured tone.